support resource hospital pharmacists trust. 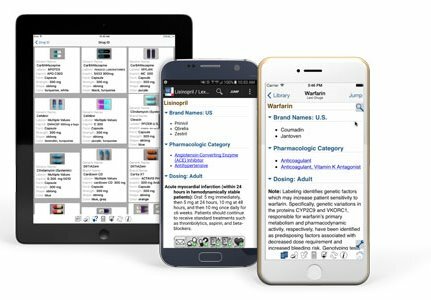 Lexicomp Essentials package: Receive mobile access to basic Lexicomp resources, including core drug content and our interactive drug interactions tool. Lexicomp Professional package: Provides mobile access to Lexicomp core drug content plus several interactive medication safety tools. Take advantage of this app for access to content trusted throughout the industry when you need to find information quickly. Lexicomp Premium package:* Includes mobile access to a greater depth and breadth of specialized Lexicomp content, PLUS, full online access to all included Lexicomp databases. When you need fast answers to drug questions, leverage trusted content from the industry’s highly respected dug information leader whether you are at your work station or on the go. Start my risk-free subscription today! What do pharmacists have to say about Lexicomp? If you would like to sign up for our e-newsletter, click here. * Offer expires 12/31/2018 (11:59 p.m. EST); terms and conditions apply. This offer is applicable to those who have never subscribed to Lexicomp. Offer is not valid for prior purchases. Offer is not valid for cash or with any other offers. Prices and offer are subject to change without notice. Taxes are additional. Discount only applies to the Lexicomp Essentials and Professional packages; the Lexicomp Premium package is excluded from this offer. Offer is nontransferable.